Thousands of civilians in South Sudan's Upper Nile state face starvation after the government blocked aid groups from using the Nile River to deliver relief food, aid agencies said Friday. The Nile is a transportation lifeline in a country with few all-weather roads or airstrips, but it currently forms the frontline in Upper Nile between rebel forces on the west side and government forces on the east. Nile transport was “temporarily put on hold” for security purposes because the river was used by rebels to attack army bases there, said South Sudanese military spokesman Col. Philip Aguer. Tapiwa Gomo, a U.N. Office for the Coordination of Humanitarian Affairs spokeswoman, said 30,000 to 35,000 displaced civilians in the west bank village of Wau Shilluk face a “worrying” situation. The Wau Shilluk clinic has enrolled 77 children with severe acute malnutrition, but therapeutic food for them has run out since resupply teams haven't reached the settlement for a month, said Shinjiro Murata, the head of Doctors Without Borders in South Sudan. “If we cannot provide anything, then in one week, two weeks, depending on the condition of the children, some of them might die,” he said, adding there are likely more children unaccounted for with severe malnutrition. 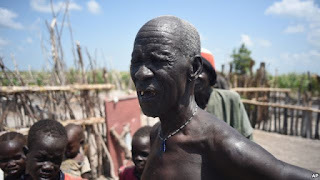 Therapeutic food supplies are stocked across the river in the government-controlled town of Malakal, about 30 minutes away by boat, but the group doesn't have authorities' permission to cross from the east, he said. In Malakal, another 30,000 people sheltering inside a U.N. base will run out of food if barges are not allowed to travel from the South Sudanese capital of Juba, said World Food Program spokesman George Fominyen. South Sudan has been at war since December 2013 as forces loyal to President Salva Kiir battle rebels led by his former deputy, Riek Machar.